Gears turn, pistons shudder and the engine of war roars to life. War is no stranger to this or any other world of men. This war is different. A tireless army borne of the blacksmith's forge and the sorcerer's art rises in the hidden places of the world. Relentless, powerful and merciless engines of conquest march by day and night. Every wall cracks, every tower falls and every city burns at their passing. Their master has no desire for prisoners or hostages. It is a campaign driven by destruction, not conquest. The refugees seek protection in the fortresses and castles of noble orders and ironhanded tyrants alike. Yet the industry of war marches to these havens, intent on tearing them asunder. The call has gone out already. Soldiers and mercenaries from across the known realms ready their weapons to face the oncoming horde. Among those that go to face the ceaseless assault of the machine only the most heroic of their number have any hope of victory. Anything less is merely fuel for the enemy's forge. 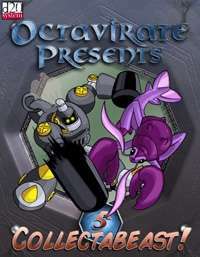 Octavirate Presents is a new series of themed mini-game supplements from the creators of the Libris Personae and Creature Weekly. 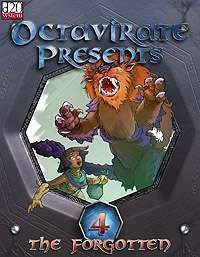 Set to fill the niche of Creature Weekly, Octavirate Presents provides regular releases of new monsters for your d20 campaign but doesn?t stop there. 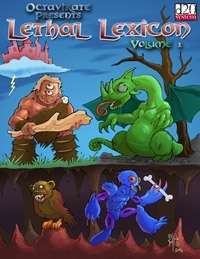 It features an adventure seed and scenario and provides NPCs, classes, feats, items or spells to work with the overall scenario or to work independently. 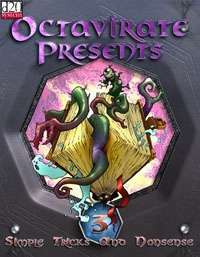 Each volume is a different gaming experience that will keep your players on their toes. * Three new golems designed for siege warfare. The ballista golem, the catapult golem and the ram golem. These terrifying engines of war take assistance from a humanoid operator to tear down defenses and ravage the enemy. * The Gear Golem. Translated from the modern rules set into the revised 3.5 rules set. The gear golem is the manifestation of the mechanization of war; a remorseless, whirling automaton of death that grinds all that stands before it into pulp. * Rules for non-standard siege ammunition. Rain death from above in the form of alchemist's fire, rotting corpses, a hail of arrows and more. * Non-Player Characters: Dyzan Setclaar is the mastermind who invented the siege golems. Who is this seemingly harmless man and why does he wage war across the realm? Mrymidia, Dyzan's bodyguard, is a marilith rebuilt into a horrifying half-golem abomination. Dyzan's forces, an army of hobgoblins, are also provided with six different ready-to-use NPC stat blocks including ground troops, archers, scouts, siege engineers, golem operators and elite guards. 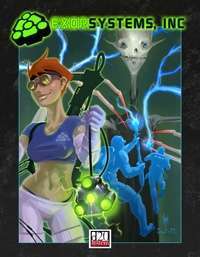 * Multi-genre Support: All monsters are provided with variant background ideas for incorporating the material into modern fantasy, modern sci-fi, post-apocalyptic and space opera campaigns to make quick adaptation easy. * Variant Rules Support: Like all Octavirate products, Octavirate Presents: the Gears of War provides quick-reference variant rules support for each creature and NPC. In addition to the standard rules for wounds/vitality, defense bonus, armor as damage reduction, modern/3.0 damage reduction, sanity loss, taint, magic rating, spell points, honor and reputation this volume presents customized variant rules for manufacturing the included golems under the modern rules set and presents technological analogue ideas with prices in purchase DC and in credits. The Gears of War can serve as a one-shot adventure scenario or the backbone of a campaign or a short series of adventures. The PCs? involvement can be as simple as escorting a group of refugees through enemy lines or as complex as spearheading a massive counter-offensive into territory held by the hobgoblin armies. Each entry works on its own or together as part of the larger scenario. Features Art from Ronald Smith, Trent Troop and special guest artist Matt Kuphaldt.